We’re fundraising for £12,000 for 2019! We’re fundraising for 1 year’s running costs of our groundbreaking trans community centre, the Belfast Trans Resource Centre. Can you help? The Belfast Trans Resource Centre is a community hub for trans, non-binary and questioning people and their families and friends in the Belfast area. We’ve been open since November 2016 and have quickly become busy with regular events, support groups and community activities. We are open to the entire trans community, so whether you’ve been out for years or have just started questioning, whether you’re non-binary or whether you’re just not quite sure, you are very welcome through our doors. 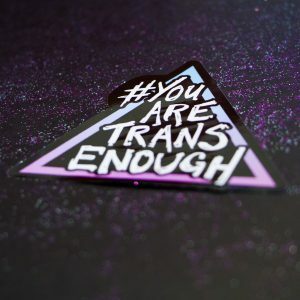 You are trans enough. We have a step-free venue that is accessible by public transport. You can find full directions and detailed accessibility information online. We’re a unique trans community centre in Belfast, Northern Ireland, built and run by trans people in the city. Everyone is welcome at our centre, and if you’re a trans, non-binary or questioning person of any sort, we’d love to welcome you along! We’re a project of TransgenderNI, an organisation focused on supporting the human rights of transgender people in Northern Ireland. We're currently fundraising to bring our work for the trans community in Northern Ireland to the next level. Can you support our fundraiser? We're changing some of our event timings in January 2019. Make sure you check the updated calendar online for events you're planning to attend.